Walking or biking the Camino de Santiago is an incredible experience and would encourage anyone who is interested in the Camino to do it. It can be tough physically, no matter which route you chose or which method you pick to get to Santiago. Walking or biking day after day for many hours can make one sore and tired. This said, rest assured the Camino is very doable if you plan well, are realistic about your pace and what you will be able to accomplish, and prepare and pack well. It is also an amazing experience and absolutely worth it! I am usually like to wing it to a certain extent when I travel; I do a minimal amount of initial research, and then get to a place and figure it out there. I ask locals for advice, and I love walking around and exploring and discovering cities on my own and at my own pace. However, this is not the way to approach the Camino and not the way I approached the Camino when my father, sister, and I completed the trek by bike in 2007. Even though we were all extremely familiar with Spain and speakers of the language, you simply cannot have a successful Camino trip without thorough planning. You can read more about our experience biking the Camino from Roncesvalles, on the border between Spain and France, to Santiago de Compostela here. The Camino de Santiago in the Rioja region. It is important to be realistic about your abilities and the requirements necessary to bike or hike every day, many hours a day, for multiple days in a row. Now, although that sounds very serious, I firmly believe that most anyone can do the Camino. You may have to make adjustments to your pace, schedule, or how you do it, but this is just fine and lots of people do this! When my family and I did the Camino, my dad was in his mid-sixties and we biked every day for two weeks straight, covering around 800 km total. Even though it’s impossible to predict exactly how your trip will go and how much you’ll be able to do a day, it is quite possible to make reasonable estimates and to plan from there. It’s also crucial to know how to prepare successfully and to set reasonable expectations. I would encourage you to check with your doctor if you’re not sure about how you’ll be able to do, or if you have any health problems that could need attention along the way. Even if you have something as simple as allergies, you should talk to your doctor about what medicines you might need to bring with you and what to do in the case of an allergic reaction, for example. If you’re in great shape, it may be realistic to expect to be able to do longer distances every day. We probably averaged around 40-50 km of biking per day and on our longest day, we did 80 km. We were very impressed with some of the walkers we encountered who were doing quite long distances daily. Our daily distances varied more than we expected, but we were able to keep to our planned schedule of arriving to Santiago the day on July 26th, the day the Patron Saint of Santiago is celebrated, so we could witness all the festivities. It’s important to keep in mind that the terrain varies greatly. On the Camino Frances, if you start near the beginning at Roncesvalles, or close by like we did, you’ll start in a semi-mountainous region. Once you get into La Rioja, the terrain is flatter, but still can be hilly in places. Once you’re in Castilla y Leon, you’re on the central meseta and the wide open plains of Spain. Towards the end, once you cross into Galicia, you’re in the most mountainous part of the Camino. Even during the flat portions, you’re biking or walking on dirt roads that are sometimes quit rough or bumpy, so this makes for slower progress than on a paved road. Unless you are an experienced hiker or biker of long distances on off-road terrains, your plan should allow for varied daily distances because of the varied terrain and other issues that can arise, like bad weather or blisters, that could force you to slow down or do less for a few days. You’ll need to research to get an idea of how much distance someone of a similar profile is able to walk or bike a day. There are many Camino forums and it’s helpful to read about other people’s experiences. This is where it’s important to be honest with your level of activity and ability to complete certain distances. There are pros and cons to each route, as outlined briefly above. The important thing is to pick the one that makes the most sense for you. For instance, the Camino Frances is the most popular route. It is the most well known and sees the largest number of pilgrims. This means that you’ll likely see multiple other pilgrims on a daily basis and maybe even multiple times during your trek. It also means that the cities and towns you’ll pass through are very familiar with people doing the Camino. Restaurants will have menus for pilgrims, no one will bat an eye at seeing you walk around in your hiking gear or bike shorts, and you will not have trouble finding an albergue, or pilgrim hostel. If you want to take the most “classic” Camino route, you should do the Camino Frances. The Ruta del Norte, or Northern Route, goes right along the North coast, meaning you can swim at beaches in the afternoons and evenings when you’re done for the day. If you want to see the stunning Northern Coast of Spain and don’t care that you’ll see fewer fellow pilgrims, or that people might be less accustomed to pilgrims in these areas, this route could be for you. There are routes that go from South to North in Spain and also from Portugal. If you want a less traditional Camino experience or are particularly interested in seeing these parts of Spain or Portugal, one of these routes could be a good option for you. It’s important to research the route well and to fully evaluate the pros and cons from multiple angles — what you want to see and the ease of figuring out logistics for example– to figure out what is the best fit for you. Now that you’ve done some research, you’ll need to start making decisions that will firm up your plan. You’ll need to decide how you will be moving along the Camino — will you be walking or biking? We biked because we love biking and that was our original idea. Walking is logistically easier because you don’t have to worry about transporting a bike and bike gear. 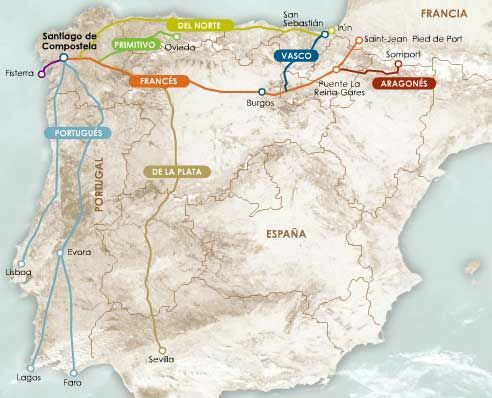 You’ll need to decided which route you’ll be traveling, as outlined briefly above — will you follow the Camino Frances from East to West, will you travel the same way, but on the Camino that runs along the Atlantic North coast, or will you travel from South to North or perhaps an entirely different route? You’ll need to decide where you will be starting, how long your Camino trek will last, and how much time you’ll spend in Spain total. You’ll need to develop a rough itinerary that matches your route. Your itinerary should have your starting point and ending point, how you’ll get to your starting point from your arrival location in Spain, and how you’ll transport yourself from your ending Camino point to your next Spain destination. You should also create a plan for where you’ll spend each night, both in terms of the city or town and where you’ll actually sleep. You may well have to adjust your plan as you go, but you should have one before starting the Camino. If you’re going to stay in Spain longer and do some traveling after the Camino, which I highly recommend, you’ll have to figure out the logistics of your luggage and gear. You want to bring the minimal amount of gear with you while you’re on the Camino, but afterwards, you will likely want more clothing options! You’ll need to figure out what to do with the things you’ll want when you’re done while you’re trekking the Camino. If you’re biking and want to stay in Spain longer, what will you do with your bike? These are all figure-out-able questions, but you should address them as part of your research and decision making process. The scallop shell is the sign of Santiago. You’ll see both yellow arrows and scallop shells marking the Camino along the way. Regardless of how you decide to do your Camino experience, you will need to prepare. Unless you are already an avid hiker or walker, you will likely need to purchase some gear. It’s best to do this with plenty of time to try things on, break in new shoes, return and re-buy certain items if needed. I’ve outlined the basics below. You may well want to tweak or bring more items. Keep in mind that if you’re carrying all of your own belonings, which most pilgrims do, the more you bring, the heavier your load will be. Sunblock is incredibly important. I cannot stress this enough! When you’re in the open spaces of La Rioja and Castilla y Leon and the sun is beating down and you don’t see shade anywhere, you will want all the sunblock, a hat if you’re not wearing a bike helmet and, if you are, a hankerchief or visor or another way to create shade on your neck. In terms of a nicer outfit, I brought a casual black dress that was one-step up from all my biking gear and my casual outfit of shorts and a tee-shirt with me on the Camino and I did not wear it once. The idea is that if you go to a nicer dinner, you’ll have something to wear. I don’t think most pilgrims do this and when I repeat the Camino, I don’t think I’ll bring a nicer option. If you do bring something, it’s best to make sure it’s light and doesn’t take up a lot of space. As I mentioned in my post about my Camino experience, we were quite cold at the end of the Camino once we crossed through Castilla y Leon and entered the mountains in Galicia. It was mid to late July and it had been very hot at the beginning of the Camino, yet we all wished we had more layers at the end. When I do the Camino again, regardless of the method (I’ll probably walk it), I will bring a warm long sleeve shirt and a light down jacket. A jacket like this provides good warmth and is so light that if you never use it, it doesn’t matter. You’ll also want to “train” before you get to Spain. I don’t mean this to sound intense at all, but you’ll want to increase your activity level so that when you start the Camino, your body isn’t totally shocked by walking or biking for hours every day. You don’t need to walk or bike every day and you don’t need to go out for hours at a time, but it’s a good idea to start increasing this activity to a few times per week. When we did the Camino, I prepared by riding my bike several times a week for maybe an hour or a few hours maximum at a time. I put water bottles filled with water in the bike bags to begin to get used to the what it would be like to bike with weight on my bike. This wasn’t a lot of training and I was working daily, so I didn’t have time to go out and bike every day. The idea is you want to get used to your gear and what it will be like to either walk or bike with weight, and to start to build up your endurance a bit. It’s great that you’re prepared and that you researched and planned well. Now be prepared for things to not go according to plan! I am only slightly kidding. Of course, you shouldn’t expect any big disasters (and hopefully none will happen), but with an experience like the Camino, unexpected obstacles are almost certain to arise. When I did the Camino with my dad and sister, there were several obstacles that came up. First, as I mentioned, we didn’t have warm enough layers for the last third of the trip when we had crossed over the meseta and were in the mountains of Galicia. Even though it was July, all three of us were quite cold. This was not the end of the world, but we were not very happy about this in that moment. Second, my bicyle seat was extremely uncomfortable. When we got to León, I bought a new seat which helped a little, but I was still not very happy with it. Third, and this one was just for me, for some reason I broke out in a weird rash all over my face about mid-way through the trek. Walkers are almost certain to get blisters or perhaps have swollen feet and ankles. Bikers, you might fall of your bike a few times. I only fell off once, when I was too tired to unclip my bike shoes after climbing a long hill, and the closeness of a water fountain meant I just did not care how I got off the bike. My dad and my sister both fell off a few times. If it sounds dramatic, it was not. You’re biking for days with a weighted bike, which makes it more tipsy, on uneven terrain. This advice should will be able to help you get started planning for your Camino trip. It is very high level and very general advice because it is everyone’s Camino plans, goals, and desired trip a very different. Las Tres Marias can help you plan a Camino experience that is customized to your interests, activity level, and ensure that you have the best possible experience.